Accurate estimation of the age at death of a body is one of the "Big Four" answers that Forensic Anthropologists can provide to help police with identification of unknown remains. Generally speaking, it is easier to estimate the age of juvenile (infants, children and adolescent) remains than of adults. This is because there are many developmental changes that occur on the skeleton and dentition at broadly predictable ages. In adults, accurate age estimation relies on more extrinsic factors such as 'wear and tear' on the joints, or gradual ossification of cartilage, which happens in different individuals at different times. Here is a quick summary of some of the different age estimation techniques that Forensic Anthropologists use. 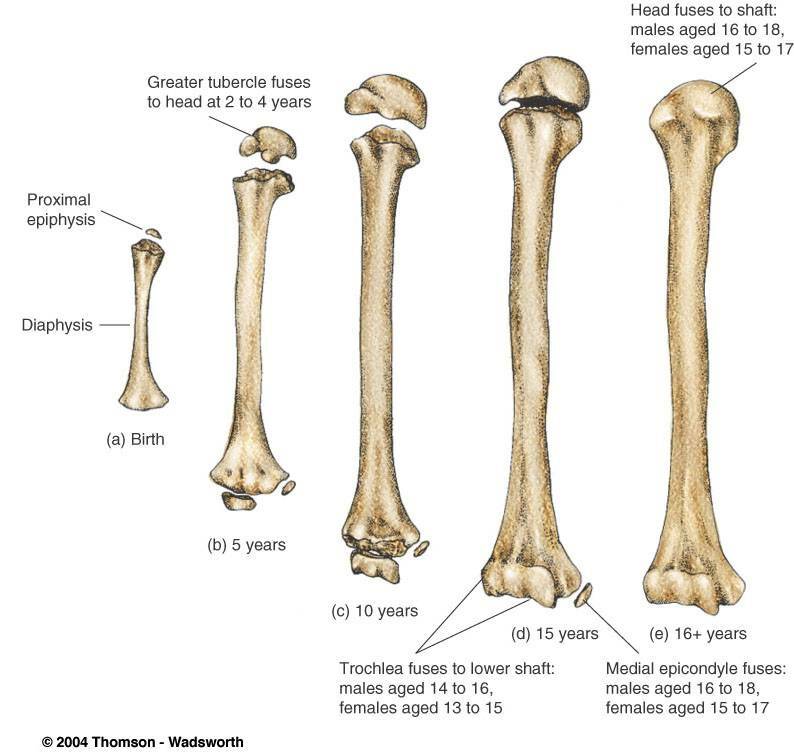 This ageing technique is based on charting the ages at which the epiphyses fuse to their bones. Epiphyses are the rounded ends of bones (think of cartoon knuckles) that initially form separately to long bones and gradually fuse to the main shaft of the bone as an individual ages. This fusion happens at generally predictable ages, and allows Forensic Anthropologists to narrow the possible age range of a set of remains by looking at the extent of epiphyseal fusion at different sites on the body. Age estimation from the pattern of dental eruption is thought to be one of the most reliable techniques available to Forensic Anthropologists. It assumes that the teeth erupt from the gums in a certain order at a certain age that is associated with the chronological age of the child. However, there appears to be a lot of variation between different populations - which is why we need this study, to accumulate data from a wide range of modern populations! The joints (or sutures) between the bones of the skull gradually close and the bones become fused together with increasing age. By charting the extent of closure of these sutures, it is possible to estimate the age of adult remains. The pubic symphyses are found in the joint at the front of the body where the two halves of the pelvis meet in the middle. The surfaces of this joint have been found to exhibit changes in roughness and texture that correspond to broad age ranges. The auricular surface is found where the ilium articulates with the sacrum. It is called the auricular surface because it roughly has the shape of an ear. It is a good area to chart age-related changes as it is often preserved in archaeological contexts. The surface has been found to exhibit changes in texture and porosity that broadly correspond to large age ranges. As you age, the cartilage between the front ends of the ribs and the sternum (breastbone) tends to ossify (slowly turn into bone). 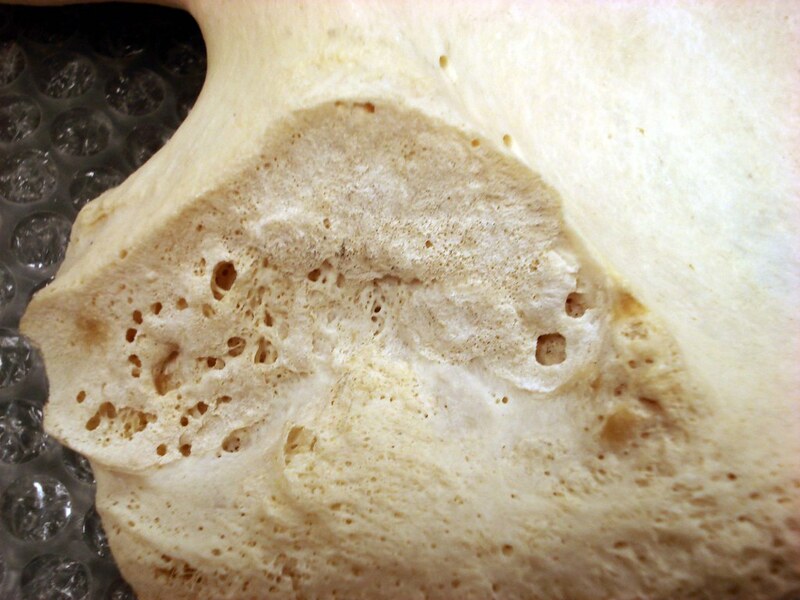 Osteoarchaeologists and Forensic Anthropologists can measure the amount of ossification of the cartilage and arrive at an age estimate. This is where there is loss of the surface of teeth due to wear from opposing teeth. This degree of attrition can be related to the age of an individual which is useful in determining the age of unknown remains.